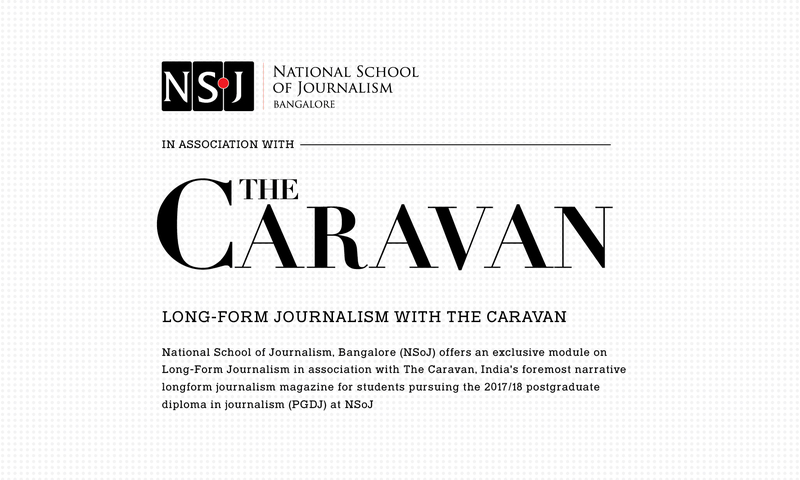 National School of Journalism (NSoJ) is a highly selective J-school that identifies and trains India's best journalistic talents. Our newsroom-focused curriculum, in-house digital news portal, expert faculty members and unparalleled industry connections prepare our students for successful careers in broadcast, print and convergence journalism. We invite you to join us and be the generation that transforms India's news media industry. Our purpose is to transform the news media industry in India by training a select group of students every year- the brightest and best in journalistic talent—to become accomplished professional journalists. NSoJ will prepare them to pursue truth in a less than perfect world, recognise the wider contexts in which issues are framed and communicate this to the public in a responsible, balanced and fair manner. We hope to create in our students a generation of journalists with the tools and perspectives to act as agents of change in the news media industry in India. Our programmes are designed to provide our students the right platform and skills to not only succeed, but to shape the future of public discourse in India. Our faculty are leading reporters, columnists, editors, authors, academics, magazine editors, documentary filmmakers, and digital media specialists who are deeply committed to training, challenging and supporting their students. We strongly encourage diversity in thought, culture, language, geography, gender, religion, academic and extracurricular interest, family circumstance, socio-economic background and more. H.S. Balram is Director of National School of Journalism, Bengaluru. He is a familiar face in Karnataka's media landscape. He was Resident Editor at The Times of India for 15 years. During his tenure, the paper reached the number one position in Karnataka in terms of readership and circulation. He was also best known for his popular column To The Point. Before joining The Times of India, he was with the Indian Express in New Delhi and served as Resident Editor of the Indian Express, Bangalore. He was a director at Asianet News Network and the host of a weekly talk show on Radio Indigo 91.9 FM. A strategic planner and principal architect of the success of The Times of India’s penetration and dominance in South India, Franklyn James was Vice President for Results and Market Development (South) for The Times Group, with close to 30 years of experience at the broadsheet. He has executed the launch of every edition of The Times of India and the Economic Times in South India, making Bangalore a veritable fortress for the paper and consolidating its lead over every other English daily. He was also a Senior Advisor at The Hindu, and is now Designated Partner, Purrah News Media LLP. Dr. Aditya Sondhi is Additional Advocate General of Karnataka. He holds a Masters in Political Science, and was awarded his PhD by the Mysore University for his thesis on “The Interface between the Army and Democracy: India & Pakistan Compared”. He is an alumnus of Bishop Cotton Boys’ School, Bangalore, where he was School Captain. He graduated from the National Law School of India University, where he is Visiting Faculty. Aditya has published two books – Unfinished Symphony & The Order of the Crest with Penguin India and is the founder managing-trustee of the General K S Thimayya Memorial Trust. Timothy Franklyn is an international corporate finance lawyer, having worked in New Delhi, Singapore and Hong Kong at some of the world’s most prestigious law firms. He regularly advises governments, corporations and global investment banks on international capital markets transactions, including sovereign debt offerings, high yield bond offerings, initial public offerings and private placements. He has published several articles in The Financial Times as well as in the Indian Business Law Journal. He graduated from the London School of Economics with an LL.M in International Business Laws. He currently serves as Chairman of National School of Journalism, Bangalore (NSoJ) which was established to produce journalists who care deeply about justice and democracy in India. Timothy also delivers the Journalistic Ethics course at NSoJ. Devleena Ghosh is an associate professor in the Faculty of Communication at the University of Technology, Sydney (UTS), and is part of the Social Inquiry Program at UTS. She is a core member of the Cosmopolitan Civil Societies Research Centre, Member of the South Asian Studies Association, the Asian Studies Association of Australia and the Australian Historical Association. She serves at the helm of The Asian Studies Review as its regional editor and is the also the director of UTS' Indian Ocean and the South Asia Research Network. Her areas of expertise are post-colonial, environmental and global studies. She guides and informs social justice related courses at NSoJ. R.B.U. Shyam Kumar is the chief executive officer (CEO) of the Puthiya Thalaimurai Group, producers of Tamil Nadu's leading television news channel, Puthiya Thalaimurai. He played a key role in the successful launch of the channel in 2011. He was also instrumental in the launch of the general television entertainment channel, PudhuYugam, in 2013. Prior to joining the Puthiya Thalaimurai Group, he had a long stint with the Times of India Group. Raghava KK is a renowned international artist, creativity expert, and tech entrepreneur, named by CNN as one of 10 most remarkable people (2010). He was inducted into the National Geographic Society as an Emerging Explorer for bringing together Science, Art, and Technology in the field of exploration in 2013. Raghava is also a four time TED speaker. His iPad art book 'Pop-it', launched at TED, re-imagined the role of storytelling in technology and won several awards, including a Kirkus Book Award for best of 2011. His recent publications address the role of creativity in cultural sensitivity and the importance of creativity in child psychological well-being and have been published by Mass General Hospital (Harvard University’s teaching hospital). Raghava advises NSoJ on strategies to prepare our students for new paradigms in visual communication methods. Dr. Glory Alexander is a medical doctor and a HIV/AIDS specialist, also the director of ASHA Foundation, Bangalore, an NGO she founded in 1998. The organisation provides a range of services in the field of HIV/AIDS that includes awareness, prevention, counseling and testing for HIV, medical care and support, other support, rehabilitation, empowerment of women, prevention of mother to child transmission of HIV (PMTCT) , adolescent health education in schools, an AIDS Helpline, capacity building, research and advocacy. In 2016, Dr. Glory Alexander was the recipient of the prestigious B. C. Roy Award in the category of outstanding service in the field of Socio-Medical Relief. Dipti Kumar is an International award winning journalist who started her career in broadcast. She has worked as news anchor, producer and reporter with NDTV Hindu (Chennai), NDTV (USA), Global Citizen (USA), BBC (London), The International Business Times (New York), The Brooklyn Daily Eagle (New York), The Independent (New York), Inside Edition, CBS (New York), All India Radio (Bengaluru), The Hindu (Bengaluru) and ANI (Bengaluru). Kumar has masters’ degrees in Television Journalism from Goldsmiths College, The University of London and Health and Science Reporting from Stony Brook University, New York. She has travelled on foreign reporting trips to Turkana, Kenya where her report on the dropout rate of girls in education was awarded the 2013 “Outstanding Story on Any Subject by a Student in USA and Canada” by the South Asian Journalists Association. She co-led and mentored a group of journalism students from her alma mater, Stony Brook University on their maiden foreign reporting to Bengaluru, India in 2015 where she taught on digital news production, understanding the local landscapes and adopting best practices for story telling on multimedia platforms. She has also lent her multimedia skills in content writing, voice overs and video production to the corporate work environment. Our postgraduate diploma programmes are structured to suit the needs of the media industry. At the same time we factor in developments that are expected to revolutionise the media industry in the next 10 years. Our environment is designed to allow the student to emerge out of campus mode, leave behind their esoteric cogitations and get down to business. The buzz of a newsroom with all its energy and quick reaction time will envelope NSoJ students, making them a part of the fourth estate the minute they walk in. You will acquire skills to confidently enter careers in television, digital radio, newspapers and magazines as well as in convergence media, which is the future of journalism, combining print, photography and video into one digital piece. Your on-the-job training begins early in the academic year. You will be allowed to try your hand at all forms of media before being tested for aptitude and choosing a specialisation that can only result in a successful career. Pedagogy is designed to factor in the rigours of news gathering from the field; developing a nose for news; production and a strong grounding in ethics. We will shape your perspectives on events and issues that matter, locally, nationally and globally. The areas of special interest at NSoJ are Politics and Society, Business and Finance, and Arts and Culture. You can choose to specialise in one of these areas for your beat. Politicians, bureaucrats, captains of industry, social workers, artists, actors, musicians, chefs, travel gurus and sports personalities will lecture and interact with you. You will be grounded in the fundamentals of journalism, law and ethics to prepare you for a credible, responsible and solid career in journalism. You will work on a live news portal and develop skills to produce news videos, blogs, news features, reviews, opinion pieces, in-depth analyses and podcasts, etc.